Why we love it: The woven textures contrast gorgeously with the more traditional blue-and-white ceramic accents. 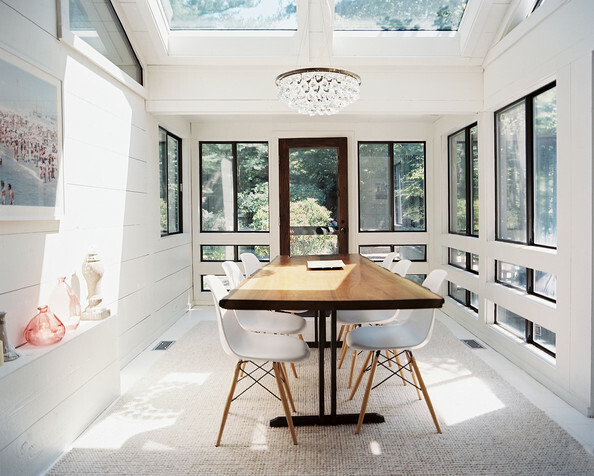 Why we love it: The sleek table and chairsÂ perfectly fit the clean lines of this gorgeous sunroom, while glass accents and a room-sized woven rug add a casual touch. Why we love it: ComfortableÂ textures and a mix of old and new give this room an inviting atmosphere. Why we love it: SumptuousÂ materials, silvery wallpaper, and a great marble mantel offer a luxurious take on traditional sunroom décor. Why we love it: Smaller can be stunning! 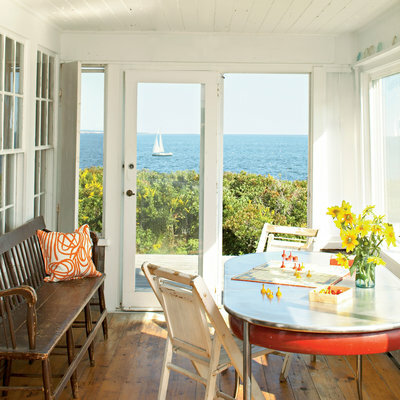 The vintage bench, along with the table-and-chair set add a laid-back feel to this sunroom — and shift the focus to that incredible view. Why we love it: A muted color scheme is punctuated by turquoise lamps and pops of pink in this casual-chic sunroom.